Although every precaution is taken, errors in prices and/or speciďŹ cations may occur in print. We reserve the right to correct any such errors. May not be used with any other promotion. Some special items may not be on display but are available via our special order program. *See store for details. 6 COVER STORY: Top Chef Canada runner-up Trevor Bird shows he is a winner after all, thanks to his critically-acclaimed restaurant, Fable. the roots of his food philosophy and his future plans with his Vancouver restaurant. 10 Tips on how to get your house ready for a fall-themed soirée. 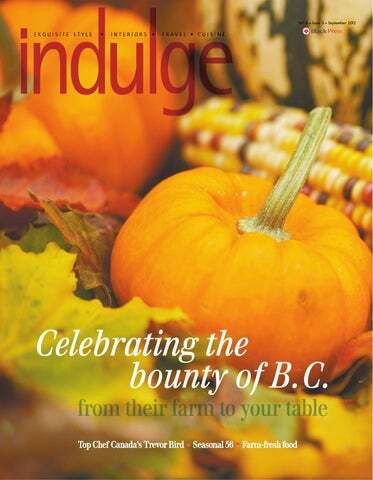 showcases the best of the Fraser Valley in innovative dishes. 21 16 Boots, sweaters, and more. It’s time to embrace the fashion for this fall season. 21 Take a day and explore the bounty of the Fraser Valley with a foodie roadtrip. 2 8 Wine expert John Schreiner explores Vista D’oro Farms and Winery and learns about its spirited history. Not only is it interesting to hear about how they do it, but as I am getting older I’m realizing how important it is to know where your food comes from and how it’s grown. I’m a bit late to the game, clearly, as our feature piece focuses on Top Chef Canada runner-up Trevor Bird, who has been working on the concept of farm-to-table for years. For him, it’s not just a trendy new idea, it’s an integral part of his food philosophy. Locally, chef Adrian Beaty of Seasonal 56 has built his entire reputation on sourcing his ingredients from Fraser Valley farmers. By doing so, he allows diners to see the possibilities that lie right in their own backyards. Sure, supporting local farmers and growers is great for the community and good for our economy, but it deﬁnitely doesn’t hurt that it tastes delicious. alking towards Fable Kitchen on West 4th Avenue, a ﬂurry of activity is visible from the street. A team of sous chefs stand behind the chef’s table, slicing, dicing and chopping in preparation for the night’s dinner service. Hands constantly reach into the cardboard boxes of local and fresh produce, which obscure the left side view of the table, grabbing the items that will be served up to customers in just a few hours. In the midst of it all is chef Trevor Bird, wearing a look of pure concentration that many fans of Food Network’s culinary competition, Top Chef Canada, will remember from his time as a contestant and runner-up. Because of that focus, it takes a few seconds for Bird, completely absorbed in the food and the preparation, to look up and notice a visitor. The restaurant is empty for now, but soon it will be packed with hungry customers, eager to sample the local and seasonal dishes Bird is becoming known for. He offers a seat and asks for a few moments so he can ﬁnish up. It’s no small task. It’s plain to see there is lots of food to prepare for tonight’s dinner service, which, thanks to rave reviews in Vancouver’s daily newspapers and exposure from the television series, will be a busy one, as it has been since opening in late March of this year. Tall and tattooed, Bird sits down at the table, which is covered with scorch marks. “Yeah, they were done with a blowtorch. My ex-girlfriend, God bless her, she did them.” The rustic – and slightly badass – design is all a part of Bird’s vision and a representation of his personality. The walls feature exposed brick, there are exposed beams reclaimed from the historic Cecil Hotel, hand-built wine and preserve shelves and the back wall is covered in chalk art depicting a farm scene. Light bulbs encased in mason jars provide the light and, throughout the restaurant the word Fable is branded in the wood. farm-to-table... fable. But everyone liked it. (Judge) Mark McEwan said he was going to steal the name and register it, and I was like uh, no. So I called and registered it.” Now, as the owner and chef of his own Kitsilano restaurant, the Algonquin College grad is serving up ﬂavours that feature B.C.’s bounty in simple dishes packed with ﬂavour. “When I was in Ottawa, after school, that was when I started to get into where my food was coming from, and just getting to know the farmers. I was working on this one farm there called Mariposa, and I would just… do whatever they needed me to do. But they had this really cool organic farm that was totally horse-powered, and that was when I was about 19 or 20, and I always held it really close to myself. I always tried to ﬁnd restaurants that really sourced their ingredients properly and had good relationships with their farmers.” While working at Sooke Harbour House on Vancouver Island, Bird found that, although the location wasn’t ideal for him, the food philosophy was a perfect ﬁt to his criteria. “They handle all their ingredients from beginning to end, and that’s how you make a good chef: working long hours, handling your ingredients from beginning to end and making it yourself. You don’t just do half a job and pass it on to somebody else. You would have a better product if you could grow it yourself, pick it yourself and cook it yourself but unfortunately, we’re not machines. But you gain so much respect for the food and for the industry when you see how much they work for it, how hard they work for it. It’s not just a hand-off of the ingredient. It closes that gap between where your food comes from and where it goes. “Basically, you have the farmer working… growing the stuff. He picks it, he brings it to the chefs, who are going to… cook it and give it directly to the customer. Everyone at this restaurant, we work stupid hard, stupid hours, and we do it because we like it. It’s not for the money, and it’s not for the women.” So, no Top Chef groupies? “Even if there were, we have no time,” Bird laughs. Although he has an extremely talented team – which includes fellow contestant and “mad scientist” Curtis Luk, whom he met on the show – maintaining the standards he has set out is an arduous task but one that Bird is clearly willing to suffer for. Be famous for your desserts. Entertain your Senses Entertain your Senses Entertain your S Senses A luxury entertainment space that suits your style and budget. Again, suggests adding a big square mirror on the table so that the arrangement creates a reﬂection. “You can add candles and it creates a nice, warm feeling and a beautiful reﬂection,” she said. “Use silk ﬂowers for the centre piece. We have poppies in warm, autumn colours and beautiful orange gerbera daisies.” Take the theme of warm and rich colours and incorporate it into other aspects of the home, including the living room. By adding a shag throw and fall cushions in autumn-inspired colours it instantly makes the living room-area more inviting. “Get a big shag throw, one that is big and ﬂuffy in beautiful fall colours, and put that on your sofa. It totally transforms the room,” she said. “Do the same thing with cushions, and mix solid neutrals with the fall-coloured ones.” She also suggests switching up the artwork in your home to reﬂect the seasons. “It’s easy to change the picture on your wall, and when you do, it transforms the room,” she said. Other suggestions include using a soap or lotion in the washroom inspired by a seasonal scent, like pumpkin or cinnamon. With a few small tweaks, your home can be the perfect venue to enjoy apple cider and good company. peppers for the evening menu. He decided to explore the ethos more fully - and never looked back. No one has beneﬁted more from Adrian’s red pepper epiphany than those lucky enough to live and grow in the Fraser Valley. “When the whole thing started, it was all about getting this discussion going: about the local products, what’s available out there, how lucky we are, the passion that people have,” Adrian explains. “And then eventually creating a Fraser Valley food scene that involved the restaurants, the farmers and the producers.” Mission accomplished. Heat the butter and sweat the shallots; add apple, thyme, salt, and pepper; sauté for 2-3 minutes until the apples begin to soften. Remove, cool and add diced Alpine Gold to the mixture; stuff chicken breasts. Sauté chicken in butter/oil mixture over medium-high heat until brown and ﬁnish cooking in oven. Place in 350 degree oven and roast 1215 minutes until cooked through. Roasted squash 1.5 lbs. baby summer squash, halved ¼ cup butter ¼ cup vegetable oil salt and pepper Heat butter and oil in pan, add squash; season with salt and pepper Place in preheated 350 degree oven and roast 8-10 minutes, or to desired doneness. Allow to sit for an hour or so to let bread crumbs absorb moisture. Form in 2 oz. cakes. When ready to serve, coat salmon with olive oil salt and pepper. Cook on a preheated grill to desired doneness. Toss the green beans and greens with the lemon basil dressing in a large mixing bowl. Taste and add more dressing or salt as needed. Pile the mixture high in the center of a plate. Arrange the tomato around the edge. Top with salmon and garnish with edible ﬂowers. ¼ cup ¼ cup ½ cup 2 tbsp. 1 ¼ cup 2 tsp. ½ tsp. Anna Kristina Boutique 119-1711 152 ST ST.
Rustic Chic A local farmhouse is the perfect backdrop to showcase fall fashion. Get the look: Page 16: Cynthia wears a white knit sweater by Animale, fur vest by Simon Chang, black leggings by Gilmour, and Anna Kristina original necklace all available at Anna Kristina Boutique, 604-536-8873. She ﬁnished the look with a pair of Steve Madden two-tone riding boots, available at Zig Zag Shoes, 604-535-1565. Page 17: Clockwise from top, Cynthia wears a ﬂowy BB Dakota dress with a chunky Theme Label cableknit sweater close at hand for when it gets cold, both available at Muse Social Fashion House, 604-560-5115. She tops off the look with a layered silver necklace by Sarah Pacini, available at Anna Kristina Boutique, 604-536-8873, and Steve Madden riding boots from Zig Zag, 604-535-1565. Cynthia tops off her Sarah Pacini little black dress with a soft and ready-forfall Sarah Pacini sweater, both available at Anna Kristina Boutique, 604-5368873. The two-tone Steve Madden riding boots from Zig Zag, 604-535-1565, are the perfect addition to the outﬁt. Cynthia tops off a Nikibiki camisole and BB Dakota purple jeans with a Theme Label sweater, all available at Muse Social Fashion House, 604-5605115. Layered necklaces are great in all seasons. Cynthia wears a necklace by Sarah Pacini available at Anna Kristina Boutique, 604-536-8873. She tucks her jeans into a pair of Fly London ankle boots from Zig Zag, 604-535-1565. Page 18: Riding boots, like the Steve Madden ones from Zig Zag, 604-5351565, are great for jeans and dresses. Cynthia’s black dress and layered necklace by Sarah Pacini can work for a casual look or a date night, both available at Anna Kristina Boutique, 604-536-8873. We are an authorized Benjamin Moore retailer committed to providing the highest-quality paints and ﬁnishes in the industry. Our design expertise, product range and store environment ensure customers get the right product, the right colour and the right result! Brio Trains are back! And Fall Fashions are rolling in! SPECIAL Romancing the Home is very excited to announce the arrival of their Thomas Sabo Shop-in-Shop. This glamorous addition of a Thomas Sabo boutique showcases the new fall/winter Glam & Soul jewellery line, along with the Classic, Rebel, Seasonal & Charm Club collections in the new Shop-in-Shop. This gorgeous jewellery collection made in Germany from 925 sterling silver is beautifully crafted & sophisticated but also fun & edgy. Settle the score with stubborn lumps and bumps like muf¿n tops. Show off the body you’ve always dreamed of. 604-560-5597 • #3 - 3268 King George Blvd., Surrey Open Mon. - Sat. 10am - 6pm • Closed Sun. Visit the Shop-in-Shop, you’ll be charmed! We are proud to announce that we now offer CoolSculpting®, the revolutionary new body contouring treatment that freezes fat. Patients are seeing undeniable and lasting results in as little as one treatment. There are no needles, no special diet, no supplements and no surgery. It’s FDA-cleared, safe and proven effective. Heather Cameron and daughter Lily. or some, Heather Cameronâ&#x20AC;&#x2122;s purchase of a piece of South Surrey property â&#x20AC;&#x201C; complete with a separate structure perfect for a little store and 500 bushels of blueberries â&#x20AC;&#x201C; would be considered kismet. But the longtime canner, cook and soon-to-be published author said it was just a case of happenstance. â&#x20AC;&#x153;It all came with the house,â&#x20AC;? she laughed. â&#x20AC;&#x153;It wasnâ&#x20AC;&#x2122;t planned. We had lived in Vancouver for 13 years and decided to buy a bit of land. We couldnâ&#x20AC;&#x2122;t afford it in Vancouver, so my mother, husband and I pooled our money and bought the farm. We bought it because we thought it was nice.â&#x20AC;? But it wasnâ&#x20AC;&#x2122;t long before the magazine stylist and story producer turned the structure into a quaint store endearingly called the Shabby Shack, where she sold the sweet, plump blueberries grown on the farm, along with an array of jams. While itâ&#x20AC;&#x2122;s only been two years since she turned the farm into her fulltime job, she has gone from distributing to dozens of stores to moving back to a smaller operation, and is now putting the ďŹ nal touches on a farm-to-table cookbook set to be published in March 2013, showcasing her made-from-scratch recipes, including her famous jams. â&#x20AC;&#x153;I had always wanted to be an organic farmer. I am kind of a Martha Stewart wannabe,â&#x20AC;? she said. â&#x20AC;&#x153;I had always sold jam at the Shabby Shack, but then my friends began asking if they could sell them at their cafĂŠ or at their bakery. So, I turned my focus to the farm and got a distributor.â&#x20AC;? OPEN HOUSE Thursday, September 27th, 4-8 pm Come Join Us! Itâ&#x20AC;&#x2122;s all about cooking with what we have, like our big veggie garden and our fancy ďŹ&#x201A;ock of chickens. Visit our NEW FALL SHOWROOM today! 2 PIECE NEON BUDDHA OUTFIT. vision and discover what is possible for you in your space. We also specialize in: Indoor Wicker/Rattan Furniture - Living Room, Dining Room, & Bedroom. We carry outdoor products all year -beat the rush and purchase now! The Old Surrey Restaurant is presenting our END OF SUMMER THREE-COURSE MENU for only $32 per person. Upcoming Events: Murder Mystery Sun, Oct. 28 Eat BC (3 course $35) Oct. - Nov.
Chef-Owner Philip Aguirre has put together a menu that highlights local ingredients and organic favourites from the family farm. The special will only last until October 7th. It is very feasible to eat and drink better...locally! Come celebrate food and wine grown right here and see why local is better. Looking for an effective and natural way of healing? Look no further than Feng Li Acupuncture & Natural Healing Clinic in White Rock. Feng takes pride in providing high-quality customer service and giving the utmost care for her patients with her friendly and naturally empathetic nature. Feng Li Acupuncture and Natural Healing Clinic also offers a wide range of herbal medicines (both Western and Chinese), as well as Western health food supplements. Feng also offers cosmetic acupuncture for facial rejuvenation and acne problems - treatments that provide effective results. Full-size Acura luxury… makes for great summer drives 7-passenger leather-trimmed interior. Super Handling All-Wheel Drive™. 6-speed automatic. All the room you’ll ever need. NOMINAL LEASE APR FOR 48 MOS. *Lease offer is available through Acura Financial Services Inc. on approved credit. 2012 MDX 6-speed automatic (model YD2H2CJN) leased at 0.5% APR for 48 months. Monthly payment is $468 (includes $1,945 freight & PDI), with $10,680 down payment. First monthly payment and $0 security deposit due at lease inception. Total lease obligation is $33,144. Option to purchase at lease end for $22,129.80 plus taxes. 96,000 kilometre allowance; charge of $0.15/km for excess kilometres. $100 excise tax, $20 new tire surcharge, GST, license, insurance and registration are extra. †$7,500 cash incentive available to cash customers on select new 2012 MDX models. Cash purchase incentive will be deducted from the negotiated price before taxes and cannot be combined with special finance or lease offers. Retailer may lease/sell for less. Retailer order/trade may be necessary. Offers are only valid for BC residents at BC Acura retailers until September 30, 2012. See Acura of Langley for full details. Straight teeth are within reach! An inspired state-of-the-art approach to the restorative beneĂ&#x20AC;ts of Chiropractic care. We offer on-site Digital X-rays and FREE Health Seminars. AM & X-RAYS X E N A E IV E C S RE INIC NEW PATIENT VISIT OUR CL U O Y N E H W 0 FOR $20.0 ($160 value) â&#x20AC;˘ Before October 31/12 Restoration Chiropractic is dedicated to helping our patients restore and retain their health. The Murphys plan on turning the old dairy farm on the property into a winery. • The annual Tour de Valley rolls into town Sept. 27 and will span 800-km northwards from Langley to Boston Bar, then south to Tsawwassen and White Rock. Teams, including the Cops for Cancer team, will bike to raise funds for cancer research. • Vintage Affair 2012 beneﬁtting the Peninsula Community Foundation takes place Oct. 25, 7-10 p.m. at Hazelmere Golf Course. Visit www.wrsscf.org/vintageaffair.php for details. • Willowbrook Shopping Centre, 19750 Fraser Hwy., hosts the 23rd annual Fraser Valley Wine Tasting Festival Nov. 3, from 7-9:30 p.m. The long-running event will feature live music and food from six Langley restaurants. DO IT DAILEY At Our Barre You’ll Get Longer, Leaner, Stronger & More Fit. in the photos • Food Network star Bob Blumer (far left) during a live demonstration at the annual EAT! Vancouver Festival, which took place June 1-3 at BC Place Stadium. • Abba tribute group Abra Cadabra (above) perform at last year’s Give Someone Hope Gala hosted by Potters. The group will also play at this year’s event which is set for Oct. 18 at the Potters’ Christmas store. Visit www.pottersonline.ca for information and tickets. • Hundreds particpated in the Great Pumpkin Run/Walk (above right) beneﬁtting Peace Arch Hospital and Community Health Foundation. This year’s run is set for Oct. 21. Visit www.peacearchhospital.com for details. This challenging one-hour class effectively strengthens, tones and lengthens the entire body. All movement is controlled and very focused, effective, and safe. Proper alignment is our primary focus. Each set of exercises is followed by a series of active stretches to develop more sculpted and supple muscles. The entire body and mind are constantly working throughout class. Through this process one’s body, posture, and physical awareness will be transformed. Our 2,000 square foot facility features two light-ﬁlled studio rooms, a fullservice locker room, child-minding, on-site parking and a great selection of eco-friendly ﬁtness apparel. We help people achieve the longer, leaner and more ﬁt bodies they seek – in a caring, encouraging and non-competitive atmosphere. W 64xH 39xD 23.5 Opens to 83 inches. 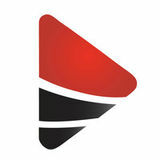 flamanfitness.com Serving BC since 1987 â&#x20AC;&#x201C; 53 years in Western Canada. Profits help support the Frank Flaman Foundation.